A few days ago I had a serious bone to pick with Bill Simmons. Simmons, in his in Sports Guy column in ESPN the Magazine had declared Kevin Garnett NOT CLUTCH. I thought he was wrong but I've come to realize he was right. None of the present Celtics are clutch. None of the so-called Big Three wants to take open mid-range jumpers. They seem to prefer passing into a crowd to taking the open shot. 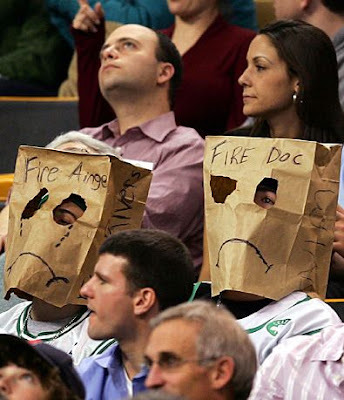 This together with Doc Rivers continuing to make stupid decisions concerning the bench and game planning has led to the Celtics taking another 2-2 record into game five. Tim Darga give the minutes if the game on the Slam Magazine website beware he is an obvious Celtic Hater.